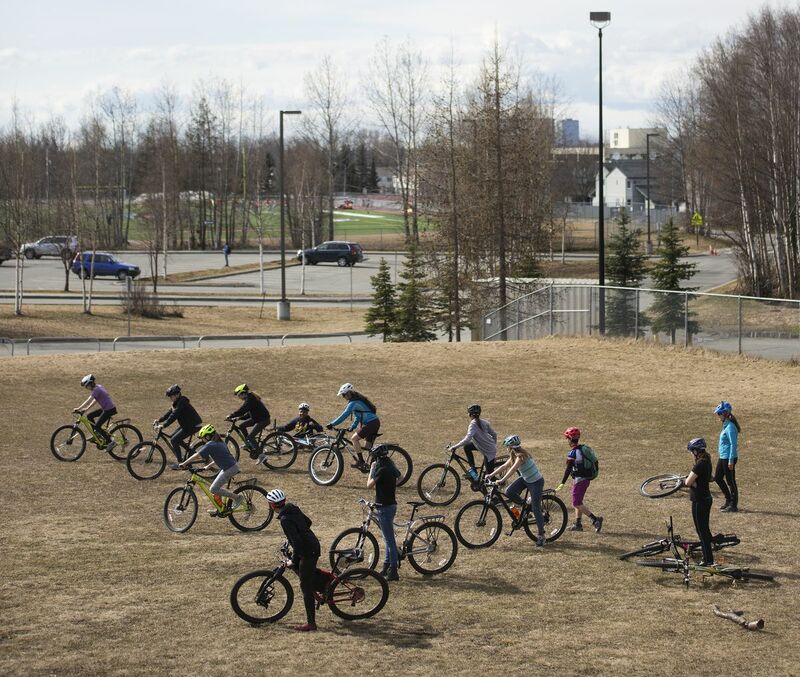 As soon as news got out that five donated bicycles — used in a mentorship program meant to encourage cycling among middle school girls — had been stolen last week from Steller Secondary School, the Anchorage community stepped up and funded replacements to get the students back on track. "People started calling and writing, and they just wanted to do whatever they could to help us. It was an incredible level of support from the community," said Lael Wilcox, one of two principal organizers behind Anchorage Girls Riding Into Tomorrow. The $560 bikes customized by seventh-grade Steller students were taken overnight on April 26, school officials told Wilcox. The girls participating in the program went to retrieve their bikes from storage on Monday but they were nowhere to be found. Undeterred by the thefts, Wilcox went to work on finding replacement wheels for the girls. News spread about the stolen bikes and people began reaching out to offer help, she said. Wilcox directed them to the program's website, and donations started coming in. Two people offered to meet her at a bicycle shop and pay for three bikes outright, which they did. "We raised more money than we needed, so we can put that toward next year's program," Wilcox said. She said she plans to expand the program by two schools next year, bringing the total to four. The girls were still in shock from losing the bikes — which they get to keep when the program ends — and were doubly so when they learned they'd be getting new ones so quickly, Wilcox said. After the girls finished customizing the bikes at the shop Wednesday afternoon, the group rode out to Russian Jack Springs Park for a lesson on mountain biking skills. The program continued with little interruption. Wilcox provided pictures of the stolen bikes and serial numbers to Anchorage police on Wednesday. She said there have been no further updates on the thefts. Steller's principal told her the suspects in surveillance footage appeared to be two older men, but no other details were gleaned from the video. Anchorage police spokeswoman Renee Oistad said the bikes have not been recovered and the case remains under investigation. Wilcox and the girls are focused on moving forward. "People felt distraught about the situation and they wanted to be part of us getting back on our feet and continuing," Wilcox said. "It was just awesome."